(PRLeap.com) SAN DIEGO, CALIFORNIA - January 28, 2016 - GreenRope, a leading CRM and marketing automation platform, announces the launch of their integration with Zapier making it easy for users to sync up all the apps they use most. "Zapier is an incredible company. Our mission has always been complete integration, and now that we are on Zapier, we truly sync up with everything. We want people to be able to use the apps they use most and make it easy for them to link to GreenRope," explains Lars Helgeson, CEO and Founder of GreenRope. 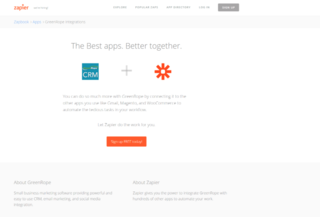 Zapier is a web automation platform that allows businesses to connect hundreds of the best-in-breed web services, such as GoToWebinar, Gmail, Evernote, GreenRope, and many more. The company makes it easy for non-developers to connect all of their most frequently uses apps together, saving time and improving productivity. Zaps are automations that Zapier triggers, which connects two applications together. A popular GreenRope Zap includes creating a new contact in GreenRope. Whether you use Salesforce, Gmail, Outlook, etc., you can automatically add a contact to your GreenRope account by creating a Zap. This contact can then be dropped into a drip campaign or trigger other actions, once established as a new contact. There are plenty of pre-made zaps to choose from, or you can create your own Zaps from scratch in the Zap Editor. Keeping track of your contacts is the foundation for building long-lasting relationships. Zapier lets you connect whatever apps you use most to GreenRope, so you nobody slips through the cracks. Integrating and streamlining your processes has never been easier. While GreenRope helps you automate all of your efforts once a contact is created, Zapier helps you get the information you need into GreenRope automatically. Read more about the GreenRope-Zapier integration.